The paper for LABYRINTH SUBLIME is custom manufactured by NewPage Corporation at one of their Wisconsin mills. We thought you might enjoy knowing more about this company’s ethics, the next steps, and an illustrated tour of what happens to the large quantity of sheets wasted during the printing process. All NewPage mills have implemented the Forest Stewardship, the Programme for the Endorsement of Forest Certification, and the Sustainable Forestry initiatives. Personally, we feel very good about using a paper with a high virgin content, being that the inherent strength is superior and because our volumes are meant to last for a great many years — an uncommon objective considering today’s emphasis on disposable items and planned obsolescence. 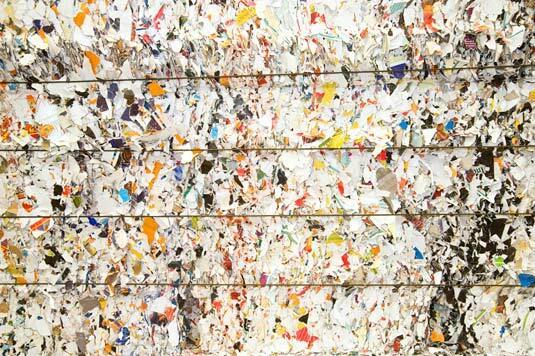 The Sterling Ultra Gloss paper for LABYRINTH SUBLIME contains 10% post-consumer recycled fiber content. During the printing process an enormous amount of paper is fed through the press until the inks flow with consistency. This is the “make-ready.” During make-ready for a single sheet (on which four pages will be printed on the front, and later four on the back), a three- to four-foot-high stack of our special paper may be consumed! Part way through the make-ready, the pressmen invite us to the approval booth and show us the first pull. Often three to five subsequent pulls are necessary as we tweak the colours and check for all the items we’ve shared with you in a previous email. During this approval process, the stack of paper that goes through the press mounts even higher. 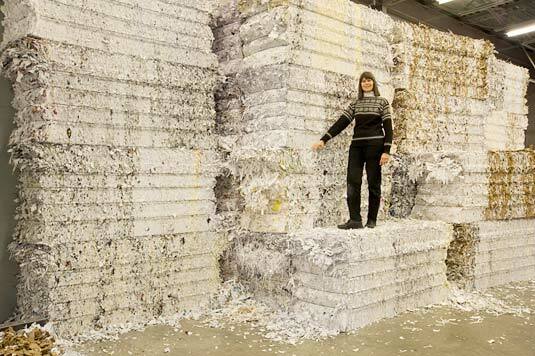 All sheets used during this process are labeled waste sheets or spoils so that not a one ends up in a finished book. By the way, the quantity of paper used in make-ready would be identical no matter how many copies we were printing, be it 40,000 or 400,000 or just 350. This is but one factor that explains why our unit costs of production are so high. However regarding the paper consumption, all is not what it seems. During the early stages of make-ready, the pressmen reuse our custom sheets four times, overprinting the new set of images atop those printed previously. At this stage, the sheets are passed through the press specifically to get the inks flowing consistently, thus previously printed sheets can be reused, twice on each side. There is a risk though... specks of dried ink can detach from these used sheets and adhere to the rubber blanket. When new sheets, are subsequently fed so we can start appraising colour, we have to watch very carefully for any oddities which would indicate that one of the four blankets (corresponding to the black, cyan, magenta or yellow inking units) requires cleaning. 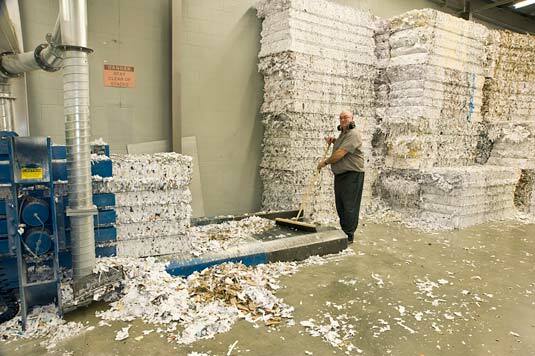 Once the waste sheets are truly well used, they are shredded and recycled. As well, when our finished printed sheets are trimmed into “leaves” or “forms” (four page sections), all cut-offs also head to the in-plant recycling department. Every bit of paper for our project, just as with that of all the other publishers’ books being printed by Friesens, leaves the plant either as books, or as shredded material. An interesting aside... over this past decade Friesens had the honour of printing all copies of the Harry Potter book series for North American consumption, both the American and the Canadian editions. As such, the security on publishers’ materials is tightly controlled. We have absolutely no concerns that the limited-edition nature of LABYRINTH SUBLIME would be compromised by any unauthorized pages of our tome being taken out of the plant. We have been mesmerized by the huge paper shredder mounted at the bottom of a large collection funnel located in the recycling department. Metal teeth attached to a spinning shaft, the shaft itself being about 5' wide and a foot in diameter, quickly chew through everything. We were warned not to lean over the funnel as we took our pictures, such as that below. Ron Hildebrand who works in this department, mentioned that once a piece of lumber inadvertently fell in, and was reduced to toothpicks in seconds. This photo covers an area of about 5' x 4'. The shredder mounted with 6" high metal teeth is across the rear, torn paper in the foreground. 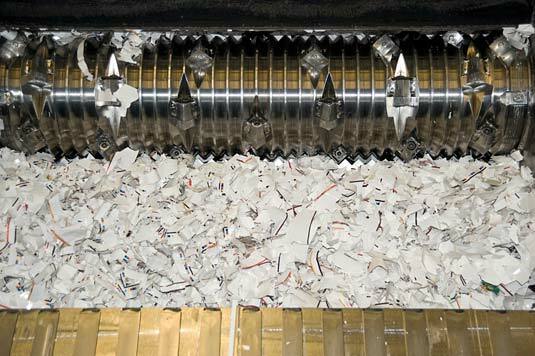 From the shredder, paper scraps are fed to a cyclone that removes and collects fines. The paper scraps are conveyed into a compactor that efficiently compresses the paper into dense bales, strapped by four wraps of wire. These bales each weigh between 1100 to 1500 pounds! Here you see Ron at the mouth of the compactor, which is ejecting a new bale. Behind his back are stacks of bales made earlier in the day. We had a lot of fun photographing these bales, the abstract component appealing to us. 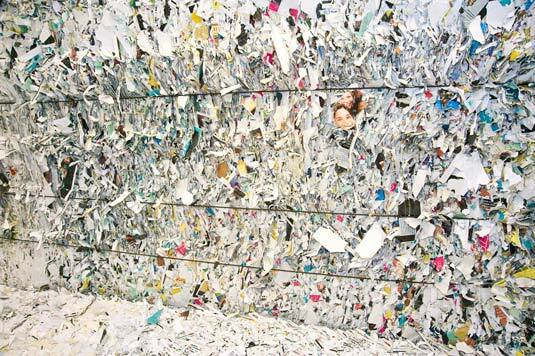 In the photo immediately below are pictures of two faces amid a chaos of paper scraps. Intellectually the bales appeal to us too. Here we are in a printing plant using paper that includes recycled content, and we are now contributing our waste sheets to the production of new paper. Depending upon what is printed on the sheets destined for shredding, also what paper stock, the colour and texture of the bales vary. Here’s a particularly colourful bale. These bales will be headed to Minnesota for inclusion in manufacturing of new products, paper and roof shingles among them. We learned that six tractor-trailers of bales depart Friesens each week throughout the year. As you’ll see by this photo with Rosemarie standing atop a bale, these are incredibly dense. It struck us that if waterproofed, the bales would make wonderful, insulated walls for buildings. On Salt Spring Island where we live, there are a few modern homes built of straw bales, stuccoed both inside and out. In Canada, the concept of straw bale houses originated in the prairies during the late nineteenth century. Wood was scarce and lumber brought in by rail was expensive, while straw was plentiful. The Buddhist text Diamond Sutra was hand-written so long ago that no one really knows when. Scholars believe it was translated from Japanese to Chinese at the turn of the fifth century. For certain, on the 15th of the 4th moon of the 9th year of Xiantong (May 11, 868) this sutra was published as a 16-foot-long scroll printed in multiple copies using wooden blocks, carved and inked. The printing date and dedication to the publisher’s parents are actually printed on the scroll. Earlier wood-block-printed scrolls have survived as well, but are undated. In 1041, movable clay type was invented in China. Knowledge of the existence of printing was introduced to Europe by Marco Polo upon return from his travels along the Silk Road. At that time, European manuscripts were laboriously copied in monasteries by calligraphers using pen and ink on vellum, and illuminated with precious pigments and gold by artisans. A few centuries later in the mid-1400s, Johannes Gutenberg, a goldsmith and businessman in the mining town of Mainz, Germany developed a mechanical printing press with moveable metal type. His opus, the Gutenberg Bible the first major book printed with the moveable type printed press, was published in 1455. We’ve learned along with bibles, that cookbooks were the earliest books printed in Europe. The first printed cookbook appeared in Italy in 1475 during the Renaissance. This shows mankind’s priorities! And to the weather ... the forecasted rain fortunately didn’t materialize. Locals are delighted that temperatures stayed cold, as rain and the resulting ice would have been quite dangerous. Today was -10°C and the afternoon had gentle snow. Nothing though, like the snow falling in New York City where several of our Collectors live! Signing off with this Fourth Report from Altona. We’ll be back to you again in a couple days!